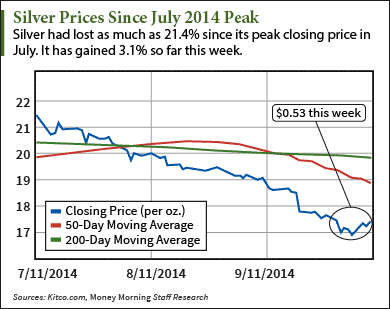 When silver prices in October slipped below $17, it was nothing short of ridiculous. The demand fundamentals for silver are more than sound – the white metal is getting a big endorsement from the industrial side right now. Expected production growth in certain industries means an additional 20 million ounces of demand by 2018, according to the Silver Institute. Metals Focus predicts silver demand to outpace GDP growth from 2014 to 2016. But as far as investment demand goes, an almost three-month sell-off has sent silver prices to four-year lows. Silver is down as much as 23.3% from its peak earlier in the year. In September, silver exchange-traded funds (ETFs), which hold physical silver and sell shares to investors at a price reflecting price movements in their holdings, grew their holdings of silver bullion by 12.2 million ounces, according to Thomson Reuters GFMS. This was the biggest single monthly increase since August 2013. In fact, close to 80% of the holdings ETFs have added this year came in just the last two months. August and September accounted for 21 million total ounces of 2014's 27 million ounces added. And as ETFs begin to bulk up their physical silver portfolio, the broader market will begin to catch on and push silver prices up. In this past week, silver prices have climbed $0.525 to $17.38 an ounce as of the markets' close yesterday (Wednesday). They climbed as high as $17.83 this morning.